I am working now in earnest on the book of essays about commercial and conversational storytelling I told you about last year. One of the tasks in finishing the book is to look over the blog posts I have drafted but not finished to see if any of them want to be in the book. This post wants to be in the book. Over the past several years I've noticed a trend in articles that tell us how we should all be thinking nowadays: an admonition to stop thinking in terms of stories because they're simple and the world is complex. I've seen this crop up probably a dozen times in the past year, though sadly I seem to have made note of only a few such examples. The problem for journalism is: Our actual problems are bigger, more complicated, more sprawling and complex, than good guys and bad guys. I don’t take any issue with the press attending to conflict. That’s Job One, actually. But the simplicity of the narrative is incredibly debilitating. News organizations chase simple narratives, and if they are prize-hunting, they look for an evil actor. What bothered me was the straightforward, unequivocal link drawn between the words "narrative" and "simplicity." That's like saying "art" and thinking everybody knows you mean "dogs playing poker." Ah, but they didn't say the simplicity of the story; they said the simplicity of the narrative. What's the difference? It's pretty clear what a story is. It has a beginning, a middle, and an end; and something happens in it. That's why most people understand what I mean when I ask them to tell me a story. It's a real-life, common-sense word, like "boot" or "cup." But "narrative" is a word rarely used by the common people, and because of that, it is sometimes viewed with suspicion of manipulative intent. That's probably why I like the word "story" so much and use it so often; it's an honest word that means what it sounds like. I always picture the two words as a kid with a balloon. Story walks on the ground, because that's where story lives, close to life, where things happen. Narrative dips and rises, soars and falls, because narrative is loosely tethered to life. That little bit of string is the only thing that keeps it from floating away. If you look at the etymology of the two words, you can see the same on-the-ground, in-the-air distinction going back in time. Both words link to ancient words for knowledge, but they have different histories. "Narrative" comes from the Sanskrit word gna (to know), which developed into the Latin gnarus (knowing or skillful) and narrare (to explain or make acquainted with). These words emphasized the transfer of knowledge, and not only through the recounting of events. In fact, "narrative" only began to be used to refer to a story or tale in the late 1500s. It is tempting to speculate that before the intellectual revolution of the Renaissance, it was not necessary to mark out the transfer of knowledge through storytelling as a separate phenomenon in need of a separate name, because it was just the way people explained things. The word "story" began with the Proto-Indo-European weyd (to see or know) and weydtor (one who sees or knows). This developed into the Greek histor (witness, or one who knows), and then the Latin historia (a record or account of events). The word story was simply a shortened form of history until the late 15th century, when it began to be used to refer to descriptions of fictional as well as factual events. So "narrative" draws its meaning from the act of communication (for teaching and for persuasion), while "story" draws its meaning from the recounting of events (for inquiry and for exploration). In recent years, however, the meaning of the word "narrative" has been jumping all over the place. In my reading, I have noticed four ways in which people have used the term. A narrative is a story. A narrative is a communicative event of which a story is a part but not the whole. A narrative is something that is like a story but does not qualify to be a story for some reason. A narrative is an abstract idea that explains something about the way things are or should be. Let's go through each of these uses of the word in turn. In everyday conversation the term "narrative" is equivocal. The most inclusive meaning of "narrative" refers to any spoken or written presentation. When in a questionnaire, for example, the "narrative" designates that answers are to be given in sentences or paragraphs instead of single words or short phrases. . . . I will not use "narrative" in this generalized, derivative sense. . . . As I use it, the term "story" is equivalent to "narrative." I like this nice, simple way of thinking, and I wish I could use the word "narrative" in this way, as a synonym for story. But this connotation of the word, while it does exist, is weak in relation to the other meanings and seems to be on its way out of use. However, at the same time, this sense of the word has interacted with other meanings in ways that (as I will explain) have created a crisis in the world of stories and storytelling. [E]ach narrative has two parts: a story (histoire), the content or chain of events (actions, happenings), plus what may be called the existents (characters, items of setting); and a discourse (discours), that is, the expression, the means by which the content is communicated. Thus, if I tell you a story, the story is the thing I told you, and the narrative is the story plus my telling of it to you (our discourse), which describes how I told it and when, and your reaction to it. A narrative text is a text in which an agent relates ('tells') a story in a particular medium, such as language, imagery, sound, buildings, or a combination thereof. A story is a fabula that is presented in a certain manner. A fabula is a series of logically and chronologically related events that are caused or experienced by actors. An event is the transition from one state to another state. Actors are agents that perform actions. And so on. This usage of the word meshes well with the ancient distinction between story and narrative, but the word is rarely used in this way outside of academia. My guess is that this is because the whole building-block structure set up here is so confusing. It reminds me of that wonderful exchange in Through the Looking Glass when the White Knight offers to sing Alice a song. The danger in building such intricate layers of meaning is that most people generally can't (or don't care to) keep track of all the layers. So to make things easier, they choose some parts to pay attention to and some parts to ignore. The end result is that some layers come to be perceived as more important, or better, than others. Then, instead of helping people understand a wonderfully nested structure, you end up promoting a simple message, like that everybody should stop telling stories and start crafting fabulae, which sound so much more interesting. I don't think it's necessary to build up special words to describe the way things play out when stories are being told. You can just call the way things play out a "storytelling event," and you're done. But that's me. I prefer concrete terms for everything, because there's less to remember and more to share. If I was the kid with the balloon, I'd probably let it go. The problem is, I can't, because there is no adjective that means "having to do with stories." It's a hole in the English language. Don't you think that's strange? Why do I have to use the word "narrative" when I mean "having to do with stories"? The word "history" has a perfectly functional adjectival form: historical. But "story" has no such thing; and as a result, I am regularly forced to jump a fence into another etymological garden and distort what I had meant to say. I would like to stop doing that, but I haven't yet found a way. Back to our list of things people think "narrative" means. Some people use "narrative" (as a noun) to refer to things that other people keep calling stories but that they don't feel are actually stories. This is a more practical consideration, and it tends to be used by people who have a more hands-on relationship to stories. I shall argue that not all narratives are stories; in particular, factual or descriptive accounts of events that aspire at objectivity rather than emotional effect must not be treated as stories. In plot-based narratives, this happens, then that happens, and then that happens. Plot-based narratives do not spark your interest or create meaning. Stories are character-based and are driven by the details that describe that character's goals, motives, obstacles, and struggles. I read a hint of exasperation in definitions that try to use the word "narrative" to separate "real stories" from things that seem like stories but are not. I understand the need to make the distinction, but using the word "narrative" to make it just seems to muddy the waters even more. scenarios, such as "you put your coin in this slot, and then this thing here whirrs for a while, and then you get your hot dog"
situations, such "it was one long hot day, I'll tell you that"
sequences, such as "on Monday we had pizza and on Tuesday we had pasta"
story references, such as "it was one of those dog-in-the-park moments, if you know what I mean"
These are all things people say that look like stories from the outside, but if you try to walk into them you find that there's nothing on the inside. I'd rather use a word that starts with "story" and adds something descriptive to it, rather than dragging that narrative balloon down. The king died and then the queen died of grief. Most people would agree that the first statement is not a story. It is a recounting of a sequence of events, but it contains no elements of causality or character experience. Iannis Gabriel would call it a "descriptive account of events." Kendall Haven would call it a "plot-based narrative." I would call it a half-story. The second sentence adds to the first, as Haven would say, a character's "goals, motives, obstacles, and struggles," or, as Gabriel would say, "emotional effect." The second sentence is a story, right? Wrong. Branigan didn't use this example to explain what qualifies as a story. He used it to explain what qualifies as a narrative. He didn't provide a term for what he considers the first sentence to be; he just introduced the two sentences with the word "these." So he left us without a term for the non-narrative thing-that-was-said. But that's not the whole story. In putting forth the king-and-queen example, Branigan was quoting E. M. Forster, who used the same sentences (in his book Aspects of the Novel) to explain what qualifies as not a story or a narrative, but a plot. a plot that is not a story or a narrative. It's no wonder people are confused about what these terms mean. Sometimes people -- more and more often lately, it seems -- use the word "narrative" to mean an overarching explanation of the way things are. This usage of the word departs from anything to do with stories, and that lays confusion on top of confusion. Worse, this sense of the word is often used pejoratively -- for example, "you just think that because you have a narrative of blame." The French term Lyotard used was grands récits, which is usually translated as "big stories," but the French word récit can also be translated as "telling" or "presentation." This hearkens back to the older meaning of the word "narrative" as an explanation that might or might not include a story. Based on my reading, I think it would be more accurate to say that Lyotard meant to speak of incredulity towards grand explanations, not grand stories. Sadly, it seems that his poor choice of words (or poor translation of his words, or both) has influenced the trajectory of the word "narrative." Narrative knowledge is the kind of knowledge prevalent in "primitive" or “traditional' societies, and is based on storytelling, sometimes in the form of ritual, music and dance. Thus in his use of the term "narrative," Lyotard did not mean to refer only to stories. He meant to refer to knowledge that has traditionally been communicated in the form of stories -- which is an entirely different thing. Under 'knowledge', then, Lyotard does not simply understand an ensemble of denotative statements to be judged solely according to the 'true'/'false' criterion in the framework of a language game among experts that has been regulated with normative precision. Instead ideas such as savoir-faire [knowing by doing], savoir-vivre [knowing by living], and savoir-écouter [knowing by listening] blend into the concept savoir [knowing], with the corresponding criteria of usefulness, of justice and/or happiness (ethical sagacity), and of audial or visual beauty. Again, this describes the type of knowledge people often transfer by telling stories, but not stories themselves. So if Lyotard used "narrative" to mean "the passing on of knowledge gained from experience," how did his writings push the word "narrative" upwards, in the direction of things that are abstract and untethered from experience? I think the reversal happened because of the word "metanarrative," which is both crucial to Lyotard's argument and devastatingly easy to misunderstand. A metanarrative has often been described as a story about stories, but I believe Lyotard meant it more as a telling about telling, or the passing on of knowledge about the passing on of knowledge. His argument, in a nutshell, was that scientists have been trying to convince the rest of us that the knowledge we have derived from experience and passed on by song and dance and story for thousands of years is no longer legitimate because they have something better: knowledge derived from proof. The problem is, they have tried to sell us on the superiority of this knowledge-from-proof with a story (in which science is the hero who has saved humanity), which is . . . a way to pass on knowledge derived from experience. Lyotard's warning was about the danger inherent in a narrative that seeks an end to all narratives, which is as nonsensical a notion as a war that will end all wars. This was a nuanced, elegant, even beautiful argument; but it's far too complex to have made its way into popular culture intact. Lyotard does not believe that science has any justification in claiming to be a more legitimate form of knowledge than narrative. Part of his work in The Postmodern Condition can be read as a defence of narrative knowledge from the increasing dominance of scientific knowledge. Can I prove without a doubt that this has happened? I can't. But it seems a likely outcome of the circumstances of the case. An author writes an elaborate, convoluted argument that relies on the nuanced understanding of a strange new word that bears a strong resemblance to -- yet contradicts -- a term in familiar use. The writing becomes hugely popular. Some read it and understand it deeply, while others skim it and miss the point entirely. People talk about it. The complex argument gets reduced to a distorted sound bite. The new word slides back into the old word it resembles. The simplified message seeps into the culture in ways the original author never intended. It's an old, old story, one that is bound to repeat as long as earnest intellectuals are rewarded for obfuscatory jargon and everybody else just talks to each other. If Lyotard had contrasted "traditional" rather than "narrative" knowledge (as I have seen his words improved upon by some), and if he had spoken of local versus global explanations, or context-free versus context-dependent explanations, he might have been better understood -- and he might not have endangered the very thing he hoped to support. Lyotard later called The Postmodern Condition "a bit of a parody" and "the worst of my books." He admitted to having "less than limited" knowledge about the science he was writing about, and he said he "made up stories" to prove his point and referred to books he hadn't actually read. I'm not sure what to make of that, but I'm not really concerned with the question of whether Lyotard was right about the postmodern condition. I'm just concerned with what he did to the word "narrative," and by extension, to what people think stories are for. I feel like should show you some examples of the way "narrative" has come to mean what Lyotard meant by "metanarrative." Here is a smattering of statements from a variety of articles, blog posts, and conversations I found on the web. See if you can pick up the thread that joins them. Stories make a messy reality seem neat, purposeful, meaningful, and that’s one of the reasons why our brains love stories. Storytelling glosses over uncertainties; methodological detail and even results can get lost in the narrative's overarching trajectory. We find messages that are framed as stories more memorable, easy to understand, and convincing. And we all fit our own memories and identity into a neat storyline as well — we tell ourselves that this led to this; this was a big turning point; this had to happen so this other thing could happen. The world is complicated — too complicated for us it seems — so we humans like narratives that compact a lot of information into simple formulations. It is important that investors think objectively when looking at these issues rather than choosing the argument that fits their own political or ideological narrative. Narratives are simple stories that we tell to ourselves and to others to explain the world. The common thread in these quotes is that they frame stories, whether personal and everyday or manufactured and promoted, as near-perfect replicas of Lyotard's metanarratives: with an "overarching trajectory," a "neat storyline," "compact," "ideological," and used "to explain the world." Lyotard's petit récits -- complex, local stories grounded in everyday reality -- seem to have disappeared from view. This may explain why so many people tell stories but believe they don't -- because they think they shouldn't. My response to the cloud of confusion around the word "narrative" has been to simply avoid using it as a noun. You will not find it used that way in any of my writing over at least the past decade. I have been using the word as an adjective, to mean "having to do with stories," but I would like to stop doing that as well, as soon as ever I find any other word that will work in its place. I believe it is time to admit that we story folk have lost control of the word "narrative" and must abandon it entirely. Our balloon has grown into a zeppelin, and it groans and strains above us. If we don't loosen our hold and let the word float back to its pre-Renaissance meaning, as a means of knowledge transfer synonymous with "explanation" (or even "worldview"), it will drag "story" even further away from the ground -- which is the sensory, physical, emotional, visceral reality of our lives. It may even now be too late. Is the word "story" still on the ground? If it is, can we keep it there? If it's not, can we get it back? This thought leads me to a TED talk I recently discovered called "Be Suspicious of Simple Stories." It was delivered in 2011 (yes I do live under a rock, thanks for asking), and it was given by the economist Tyler Cowen. I wish I had noticed this talk years ago, because it is full of easily fixed mistakes. Someone like me finding this talk is like a carpenter finding a broken down tool shed in an otherwise picture-perfect garden. It breaks my heart to see somebody saying a thing like this, and I cannot do otherwise than my best to fix it. [T]he more inspired a story makes me feel, very often the more nervous I get. My first thought on seeing this was that it reminds me of what Marshall Rosenberg said about stories in his book on Non-Violent Communication (which I explored in a previous blog post). Both of these people recounted personal, emotional, visceral reactions to stories, and then proceeded to explain them using abstract rationalizations that ring hollow. The good and bad things about stories is they're a kind of filter. They take a lot of information, and they leave some of it out, and they keep some of it in. Yes, stories filter information out. They also add information in, in the form of ideas, values, emotions, and perspectives. Stories don't just filter reality; that's too simple a description of what they do. Stories play with reality. That's what they're for. Telling and listening to stories is a form of play, and play holds a prominent position in human life because it makes us capable of adapting to varied circumstances. But the thing about this filter, it always leaves the same things in. You're always left with the same few stories. ... [I]f you think in terms of stories, you're telling yourself the same things over and over again. It is true that various people have written books over the years claiming that there are only seven or twenty or thirty-six or other numbers of stories. But that doesn't mean much. You can lump just about anything together into a small number of types if you ignore the details. There are only five kinds of living things on earth -- Monera, Archaea, Protista, Plantae, Animalia, Fungi. That doesn't mean life on this planet is simple. Can you imagine David Attenborough intoning in his irreplaceable voice, "There are only five categories of life on earth -- so there's no point looking at any of it, is there? This documentary is over." No dancing birds of paradise; no dolphin pass-the-thing parties; no angler fish plunging through the dark with murderous intent; no night-blooming dead-thing flowers; no whale mothers desperately supporting their exhausted babies as they struggle to reach the surface to draw one more breath. Just a list of five things. Yes, there are seven kinds of stories. There are twenty kinds. There are thirty six kinds. There are billions of kinds. How many kinds of stories you think there are says more about you, or what it is you're trying to do, than it says about stories. I remember a funny story about classifying things from my days in biology. There was this famous professor whose ego was legend. One day he was walking through a nature preserve with a gaggle of adoring students, calling out dense Latin references to various species he could identify from the merest glimpse. The crowd responded to his pronouncements the same way people say "ooh" and "aah" as fireworks appear in the sky. One particular bit of bright color in the field ahead led to an instant identification as a rare species of flower. But as the group approached the rare flower, they realized that it was not a flower at all, but a scrap of litter, and they began to laugh. The professor, discovering his mistake, cleared his throat, raised his gaze, and began to call out species names again; but the magic was gone, and the crowd laughed more with every identification he made. That story always comes to my mind whenever I see people "ooh" and "aah" over some new pronouncement about how many kinds of stories there are. There was a study done, we asked some people to describe their lives. And when asked to describe their lives, what's interesting is how few people said, "mess". . . . [W]hat people wanted to say was, "My life is a journey." 51% wanted to turn his or her life into a story. 11% said, "My life is a battle." Again, that's a kind of story. 8% said, "My life is a novel," 5% "My life is a play." There's a good reason people said their lives were stories: they are stories. A life is a sequence of events in time. So is a story. That's part of why we tell stories: because they resemble our lives. But Cowen seems mostly bothered by the fact that people represented their lives as simple stories. It seems likely that in this study he gave people a limited context -- a small space and a small time -- in which to describe their lives. So of course people told simple stories. They were asked to. In storytelling, context shapes content. This is true to such an extent that the same story told in two different contexts can only be seen as two different stories. Saying "we gave people two minutes and they told us simple stories" is like saying "we gave people two minutes with a pile of popsicle sticks and feathers, and not one of them painted the Mona Lisa." I would challenge Cowen to signal his willingness to listen deeply to the complex stories of people's lives, and then see whether he still hears simple stories. I don't think he will. So how many of you know the story about George Washington and the cherry tree. It's not obvious that's exactly what happened. Of course that's not exactly what happened. Nobody thinks it is. That cherry-tree story is a category of story I call a condensed story, one that has solidified into something very small yet quite meaningful (in American culture, anyway). It's most likely on its way to becoming a proverb, or even an idiom, which is the most compressed form of story. But just because compressed stories exist, it doesn't mean other stories don't. [N]arratives tend to be too simple. The point of a narrative is to strip it way, not just into 18 minutes, but most narratives you could present in a sentence or two. Note here that Cowen has equated the words "narrative" and "story." This is what I meant, above, when I said that two senses of the word "narrative" have been interacting in a way that has created a crisis. This is the crisis. Two senses of "narrative" (as a story and as an overarching, context-free explanation for the way things are) are in conflict and in conflation at the same time. The result has been confusion, which has created logical errors such as this statement. Yes, of course there are simple stories in the world. But it is a mistake to believe that all or even most stories are simple. This is the equivalent of walking into a village, seeing three children at play, and proclaiming loudly that the village is populated solely by children. Stories have not become simpler. What has become simpler is the subset of stories people have been paying attention to; and that's a trend I've been thinking about. When someone can't see something you can see, it's never enough to say "just look around you," because that's the problem: they haven't been looking, and they aren't going to start looking because you told them to. No, what you need to do in a situation like that is to show people what they haven't been seeing. So I'm going to show Tyler Cowen (and everyone else who thinks stories are simple) that stories can be beautifully, deeply, magically complex. There are at least three ways for stories to be complex: internally, relationally, and externally. A story that is internally complex is rich, deep, detailed, full of nuance, difficult to describe succinctly: bigger on the inside than the outside. This is probably the hardest of the three types of complexity to communicate, because it depends on the experience of narrative immersion, which no one can have for anyone else. If you've never read Thomas Mann's The Magic Mountain, the term "unbounded advantages of disgrace" can never mean anything to you. If you've never read George Eliot's Middlemarch, you'll never understand what it means that I sometimes feel like my own Casaubon (and sometimes like my own Dorothea). I could cite many more examples, but it won't help if you haven't been where I've been. That's why we read great literature: because it gives us a place to play that is as complex as life itself. This is not to say that internally complex stories only exist in literature. Sit down with any old person and really let them go -- that is, create a context in which long and complex stories are both appropriate and appreciated -- and you'll hear enough internal complexity -- enough mess, if you like -- to sate any appetite. The problem is that hardly anybody does this anymore. That doesn't mean the stories aren't still there, waiting to be told and heard. It's a mistake to think they're gone just because we're not listening. A story that is relationally complex may not be full of nuance, but it is full of stories. It is a nested story, with levels upon levels, like a tardis in a tardis. To illustrate this type of story, I would like to show you a photograph. This is page 35 of my copy of Tales from the Thousand and One Nights. As you can see, the page is dog-eared. I have learned to interpret my dog-earing of books as a sort of running commentary. 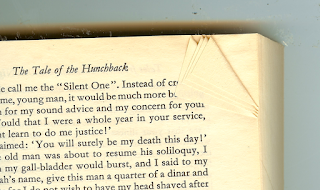 A small dog-ear means that I was enjoying the book but not particularly enthused by what I was reading at the time. A large dog-ear shows that I was energized to continue and frustrated to have to stop. A lot of my books start with small dog-ears then progress to larger dog-ears as the story heats up. A multi-page dog-ear denotes my maximum level of enthusiasm, frustration, or both. This particular dog-ear I remember. I made it because the level of story nesting I encountered on the page exceeded my ability to make sense of what I was reading. At the moment I stopped reading, I was in the middle of a story called The Tale of the Young Man and the Barber of Baghdad. 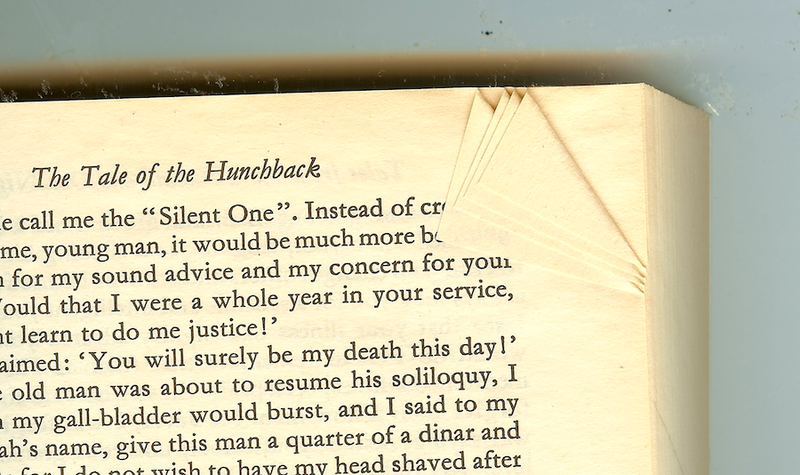 That story was nested inside another story called The Tailor's Tale, which was itself nested inside The Tale of the Hunchback. The Tale of the Hunchback, as told by Scheherazade, was nested inside The Tale of King Shahriyar and his Brother Shahzaman. "What kind of talk is this?" cried the barber. 'By Allah, I will accept nothing before I have shaved you. You must know that I would regard it as a pleasant duty and a great honour to serve you even without payment. For although you do not seem to appreciate my merits, I appreciate yours. I remember one Friday when"
. . . and then I could bear no more. At five levels down I was suffocating in stories, and I simply had to surface for air. That's a deeply nested story. There are many such in the historical records of storytelling around the world. Pick up any book of folk tales and you'll find nested stories like this. Nesting stories was once so common as to be an expected part of every well-told story. Today we expect our stories to follow simple, single arcs; but this is a pale imitation of the storytelling we used to expect. Way back in 2003 I did a little research project on story form. For it I created outlines of folk tales to understand more about how they were put together. I developed a sort of grammar I could use to diagram a story, using letters to denote its elements: exposition (E), context-setting event (C), turning point (T), protagonist action (A), reversal of fortune (R), and resolution (S). This means that the story started with an element of exposition (E), followed by one context-setting event (C1), then entered into a nested story ([ETSE]), which had its own exposition (E), turning point (T), resolution (S), and concluding exposition (E). The next nested section of the story ([CTRS [TRS]]) had another story nested inside it, and this structure repeated later on in the larger story. Lately my son and I have been enjoying Emily Wilson's excellent new translation of The Oddysey, which passes back and forth between different levels of nesting in a way that we find richly satisfying. Whenever I break through to another level of nested stories, I always get this feeling in my mind that links to the feeling in my hands when I plunge them into the soil of my garden. Delving into a nested story feels like life, and it feels good. That's why we love it so much. But we don't get much exposure to nested storytelling these days, not unless we seek it out; and I think our poor story diet has influenced our beliefs about what stories are good for. I would venture to guess that every person who has written a well-meaning blog post or given a well-meaning talk about how stories are dangerous because they're simple has never immersed themselves in a deeply nested story. You could not possibly experience such a story and continue to claim that stories are universally simple things. Going from watching a television sit-com to imbibing the raw energy of one of the great epics of oral literature is like getting off a carousel horse and mounting a living, breathing monster of an animal. Stories can be much more than you think they can be. They can be full of life, and they can be far from simple. The attentive reader will have noticed that I have again given an example from literature. This is not because such examples are more important or numerous; it's because you can read The Oddysey as easily as I can. Personal stories are often just as nested, but it's harder for me to point to any you can read. What I can tell you to do is to listen. Find an old person and give them permission to tell you what has happened to them in their life. Or gather a few friends and keep nudging the conversation back to things that have happened to people. I guarantee that you will hear some nested stories. It might take a little while for the nested stories to come out, because people aren't used to being listened to anymore. But be patient; the stories will come. A third way in which stories can be complex is to be connected to each other. This is another aspect of storytelling that was once so common as to be unremarkable but has been recently neglected. One culprit has been the compilation of folk tales and urban legends into printed volumes that have removed the connections among stories. Classifications of folk tales by surface-level categories such as "animal tales" and "tales that involve demons" have also severed ties that traditionally held such stories together in use. Apparently, few folk tale collectors thought to ask their sources, after they had told a story, what story they usually told next and why. This artificial isolation of stories has caused us to see them as things that are sorted and enumerated, not related to each other in complex webs that negotiate additional layers of meaning. The tension between preserving folk culture and creating an entertaining diversion started along with the very first written versions of folk tales (going back, most likely, to Homer). The brothers Grimm, for example, edited their folk tale collection six times in thirty years, due primarily to criticism from a public that wanted their story books pleasant, simple, and fun. So they lived in fun and joy for some time, and the fairy did not come behind it, until one day Rapunzel started and said to her: "But say to me Frau Goethel, my clothes-lets are becoming so tight and will not fit any more." Ach you godless child, spoke the fairy, what must I hear from you, and she noticed right away, how she was deceived, and was all enraged. In the 1856 edition, the prince begins by asking Rapunzel to marry him; and after she agrees, they form a plan for her escape. It is to work on that plan, not for "fun and joy," that they meet every day. The enchantress didn't notice a thing until one day Rapunzel said to her: "Tell me, Mother Goethel, why are you so much harder to pull up than the young prince. He gets up here in a twinkling." "Wicked child!" shouted the enchantress. "What have you done? I thought I had shut you off from the rest of the world, but you betrayed me." The volume in the reader's hands lays claim to very little merit, beyond that of careful selection. . . . Lack of matter there was none; the object was to get together, in an accessible form, a variety of pieces, which were only to be met with, scattered throughout voluminous works, and then, not infrequently mixed up with others of a less interesting (not to say objectionable) character. Folk life is messy; that's what keeps it real. I would personally love to read verbatim in situ transcripts of every folk tale ever collected, but apparently I am in the minority, and the collections we have reflect the audiences for whom they were written. We are well aware that the categorization of our highly selective examples is, in some instances, arguable. It is as if the stories themselves are laughing at such an attempt to pin them down. Instead of arranging the tales according to some classificatory scheme (e.g., romantic tales, tales of magic, etc. ), I have arranged them in eleven cycles or sessions, each consisting of eight to eleven tales. . . . Thus, we will encounter similar themes in point and counterpoint several times, often expressing contradictory attitudes (e.g., about fate or sibling bonds), so that tale becomes relevant to tale; they interpenetrate and interpret each other, and together create a world. My predecessors have taken isolated stories and re-told them at various lengths -- but they have, as a rule, remained isolated. Here I have tried to tell the tale of the Heroic Age as that single whole which the Greeks believed it to be. Do I remember these two books better than the twenty-odd other compilations of folk tales I've read? Yes, I do. The Indian book in particular has always been my favorite, and it might have something to do with the relationships among its stories. I used to disdain folk-tale collections that were centered around themes because I thought they were further from their sources, but I've come to realize that they may be closer to the way people experienced storytelling in the past. No storyteller in the world has ever sat around listing the stories they knew in the order specified by the Aarne–Thompson Motif-Index. They connected stories the way we do: by reminding. One thing led to another, and so on. So if our compilations of folk tales don't capture the external complexity of historical storytelling, what does? What are we missing from our picture of how people have told stories in the past, and how does it relate to the ways people tell stories today? It takes some looking, but there are still hints and glimpses of connections among folk tales. I'll show you a few I've come across. We may see sometimes, when a whole harvest has been destroyed by storm or other calamity that heaven sends, still some little nook has found a shelter near the low hedges or bushes by the roadside, and some single ears of corn have remained standing. When again the sun shines favourably, they grow on, unnoticed and in solitude: no early sickle reaps them for the great store houses, but in the autumn, when they are ripe and full, some poor hands come and seek them, and, gathered ear by ear, carefully bound, and more highly prized than other whole sheaves, they are carried home, and the whole winter long they serve for food -- perhaps also, they are the only seed for the future. So it has appeared to us when we have seen, how, of so much that bloomed in former times, nothing has remained but ballads, a few books, some sayings, and these innocent household stories amongst the people. The places near the stove, the kitchen-hearth, the steps to the loft, feast-days still kept, meadows and forests in their quietude, above all, untroubled fancy, were the hedges that protected and delivered them over from one time to another. What a sense of loss. Note the references to isolation: "single" ears of corn remaining "in solitude" and "gathered ear by ear" to be "carefully bound" (into collections). The saddest thing of all, to my mind, is that this was written two centuries ago. If the brothers Grimm saw their story collection as such a meager remnant of the formerly abundant life of stories, just think what the social life of stories must have been like four centuries ago. The book Traditional Slovak Folktales (collected by Pavol Dobšinský and edited and translated by David L. Cooper) is near to my heart because my family comes from the region; indeed, I was happy to recognize some fragments of culture -- metaphors, rituals, superstitions -- I heard as a child. In the introduction to the book, the editor describes a particular storyteller who sounds a lot like the grandfather I can barely remember. One Slovak narrator from whom a later generation of folklorists collected tales, Jozef Rusnák-Bronda, can serve us as an example of a gifted storyteller. Born in 1864 in the upper Hron River valley, he learned the trade of carpenter from his brother-in-law and traveled around northern Slovakia (then Upper Hungary) for his trade. . . . Unable to continue working due to an injury, he nevertheless continued to go to the mountains with the woodcutters, where he performed various duties, including cooking and guarding the hut. Later, when even this work became too strenuous for him, the woodcutters helped him with his duties in order that he stay with them and tell his stories, which he told during the evenings and when there was bad weather. He would tell stories of accidents and jokes as well as demonological stories and the longer wondertales. Often he would receive an extra portion of liquor for his tales. In the village he would occasionally be invited to women's spinning parties to tell tales, but he would change his tales when children were present. So that's how folk tales were told. It sounds a lot like what happens when my family gets together today, and maybe you recognize this description as well. I'm not sure how many people are telling stories we would call folk tales anymore, but we are definitely still telling stories, and the circumstances of the telling don't sound all that different. We used to always tell this joke about one of my sisters: that if you missed a TV show you could just ask her about it -- but you had to be careful, because her retelling was usually longer than the show. She still tells a lot of stories, and they're still pretty long and complicated, but I'm probably the only one who notices (or at least thinks about) what is going on. That's probably the way storytelling has always been: some people just can't help spinning yarns, and everybody else enjoys it (and puts up with it at the same time), and only a few pedants think to ask what it all means. beings encountered on his travels. . . . [Another storyteller] had a serious, rather ponderous style of delivery and liked to give the magical and horrible aspects of his stories their full value. That's something we miss when we read through a collection of folk tales: that not every teller told every tale. One tended toward the magical, another the historical, a third the instructive. That sounds a lot like the way people talk today, doesn't it? That one sister I mentioned tells long stories, but I tell more stories. I've noticed that I rarely make it through more than two or three minutes of any conversation without telling a story about one thing or another. It's just how I think, and I can't help expressing myself in that way. If somebody collected stories from my sister and myself, they'd describe our stories differently, but we'd still be part of the same tradition. [S]tories are often told in chains, one word, character, or idea bringing to mind a related one, prompting another storyteller to offer a contribution. . . . Rather than being self-contained units, [stories] are often incomplete episodes in a progression that goes back deep into a tribe's traditions. Tales are narrated, partly sung, mimed, and partly dramatized on a great variety of domestic, legal, ritual occasions to entertain, to instruct, to explain, to moralize. It would be inexact to isolate for any given tale a single one of these functions. Most, if not all, Nyanga tales simultaneously perform recreational, pedagogical, etiological, and moralizing roles, but specific situations may demand special emphasis on a single function. All Nyanga know a certain number of texts; some are able to narrate, sing, or recite them coherently and completely, others are confused narrators, able only to communicate the essence of their content. We've gotten used to the idea that the people who told the old folk tales were very different than we are today. If that is true, I think it's true in degree and not in kind. Folk life is not lost to us, not yet. It continues, everywhere around the world, in city and country, in culture high and low. But it has changed, in two important ways. First, the telling of stories has become something that only a specialized priesthood can admit to doing. Though many people still tell stories, they don't call it storytelling. They call it something else: chatting, gossip, catching up, spending time together, having a nice conversation, getting to know each other, and so on. I don't know how many people I've met who tell story after story, clearly relishing the ritual, but when I hint at the possibility that they might be telling stories, react as though I've accused them of taking on airs, pretending to be something they have no right to be. "Oh, no, I was just talking," they say. You can see the same thing if you do a Google image search on the word "storytelling." You will see images of books, stage sets, and sales pitches, but hardly any pictures of people talking to each other. If you want to see pictures of storytelling, you have to search on the word "conversation," because that's where storytelling is hiding. We're just talking. But wait! you say. Didn't you just say that people didn't think of their everyday storytelling as anything special in the past? Didn't you say that only a few pedants paid attention to what was going on? Yes, I did. But I believe -- this is based on what I've read and observed -- that there was once a widespread sense of ownership of the words "stories" and "storytelling" among the great mass of people. Telling stories was once something everybody thought everybody did. Now it isn't. The second change that has come over storytelling is that because people think of stories as things that are isolated (both from other stories and from other aspects of life), they don't recognize forms of culture that used to move back and forth easily between storytelling and other modes of communication. The lines we once drew lightly around storytelling have risen into walls. For example, when a meme makes its way around the internet, people tell stories about it; they can't help it. But when I try to point out that people have been telling stories about memes, or even that some memes are stories, I've noticed that people tend to have one of two reactions: they try to deny that the stories are stories ("we're just talking"), or they try to turn the stories into what they think are legitimate stories -- that is, movie plots or newspaper articles or novels or stand-up comedy performances. In other words, stories are still very much features of daily life, but the idea of stories as features of daily life has been much reduced. And I believe that this reduction in awareness of everyday storytelling has contributed to the belief that stories are things of which we should be suspicious. All right. Now that we've seen how complex stories can be, let's go back to Tyler Cowen's talk. We're biologically programmed to respond to [stories]. As a former evolutionary biologist, this makes me cringe. Programming is the wrong metaphor for any living thing. We are not built; we grow. As one blogger recently put it, "For Mendel’s sake, ban the cyborg-speak, will you?" People tell and respond to stories because stories do a lot of useful things in our lives. Stories also create dangers in our lives. If the benefits of stories did not outweigh their dangers, we wouldn't still be telling stories, just like we're not still living in trees or drilling holes in people's skulls. They [stories] contain a lot of information. How can stories be simple and at the same time contain a lot of information? They have social power. They connect us to other people. So they are like a candy that we're fed when we consume political information, when we read novels. Saying that something is "like candy" is generally understood to mean that the thing is attractive yet bad for us. Using things that have social power to become more connected to other people seems like something that is good for us. So I don't understand how this makes sense. I would understand it if Cowen said "Stories are fun but useless, so they are like candy." That would still be wrong (because not all stories are fun, and not all stories are useless), but at least it would make some sense. This doesn't. As a simple rule of thumb, just imagine that every time you're telling a good versus evil story, you're basically lowering your IQ by ten points or more. First: biological programming and IQ are both overarching, context-free explanations that are wrong, misleading, and often used to manipulate. Second: We need to make a distinction between simple and simplified. There is nothing in the world wrong with a simple story. We all start our lives understanding only the simplest of stories. As we grow, we begin to understand and tell stories that are more and more complex. It is true that if you are only capable of understanding and telling simple stories as an adult, you need to learn more about stories. But I don't think that's what Cowen is talking about here. I think, when he mentions a "good versus evil" story, that what he's really talking about is simplified stories. A simplified story is a story that has been made simple for a reason, and that reason is almost always manipulation. If we take his "good versus evil story" to mean a simplified story, that is, one that deliberately removes nuance to influence or control, then I can unequivocally agree with his statement. Too many people today experience too many simplified stories and not enough simple and complex stories. We'll get to what I think we can do about that later on in the essay. Another set of stories that are popular-- if you know Oliver Stone's movies, or Michael Moore's movies, you can't make a movie and say: "It was all a big accident." No, it has to be a conspiracy, people plotting together, because in a story, a story is about intention. A story is not about spontaneous order or complex human institutions which are the product of human action, but not of human design. No, a story is about evil people plotting together. This statement reveals a severely limited view of the universe of stories. If Hollywood movie plots are the only stories you have ever been exposed to, then yes, you might think all stories are about intention. But oh, what you have been missing. The depth of stories about spontaneous order, and about complex human institutions which are the product of human action but not of human design, and about every other thing under the sun, will astound you. Actually, when I read the words "complex human institutions which are the product of human action, but not of human design," my mind flew like a shot to Dombey and Son, Dickens' complex tale about a miserable man so deeply trapped in the human institutions we've built around money and greed that he is unable to love his own child. I could probably come up with ten more examples, some of them from my own life experience, but I don't think I have to. As a good rule of thumb, if you're asking: "When I hear a story, when should I be especially suspicious?" If you hear a story and you think: "Wow, that would make a great movie!" Another kind of problem with stories is you can only fit so many stories into your mind at once, or in the course of a day, or even over the course of a lifetime. Well, yes, sure, you can only fit so many stories into your mind over the course of your lifetime; but that's because you will only be alive for a limited time. That doesn't mean anything about stories. Just because I can only breathe so many times in my life, it doesn't mean I should stop breathing. There's another reason we don't need to worry about running out of space for stories in our lives: stories pack well. They expand when we need them, but they can also shrink to an astonishingly small size when we need them to do that. We are capable of telling, listening to, making up, and making sense of millions or maybe even billions of stories in our lifetimes. In fact, most of us do exactly that, whether we know we're doing it or not. For instance, just to get out of bed in the morning, you tell yourself the story that your job is really important, what you're doing is really important. Well, there's your problem right there. "My job is really important" is not a story. It's a statement, an opinion, a belief, an explanation maybe. But it's definitely not a story. In a story, something happens. Aristotle called it potentiality followed by actuality, meaning that something could happen, and then something does happen. That's a story. "My job is important" is not a story. Ideally, I ought to have some very complex story map in my mind, you know, with combinatorials and a matrix of computation, and the like, but that is not how stories work. No amount of combinatorials or matrices of computation will make a belief into a story. Stories, to work, have to be simple, easily grasped, easily told to others, easily remembered. I don't know where Tyler Cowen got this idea, but it is completely untrue. Stories, to work, have to have a beginning, a middle, and an end; something has to happen in them; and they have to be told and heard by people. They do not have to be simple. In fact, few stories are simple. Most are complex, even if they are short. So stories will serve dual and conflicting purposes, and very often they will lead us astray. Yes, this is true. This is one of the amazing, heartbreaking, life-saving complexities of stories. A person who claims that stories are simple, and then in the very next sentence gives an example of a way in which stories are not simple, does not understand stories. However, these two sentences do get one thing right about stories: that it is impossible to say one thing about stories without soon finding oneself saying the opposite thing, because with anything you can think of that stories do, they also do the opposite. They bring us together; they push us apart. They make us smart; they make us stupid. They lead us astray; they bring us home. That's one of the reasons why, while some stories are undoubtedly simple, stories as a whole are as complex as we are. A third problem with stories is that outsiders manipulate us using stories. Yes, and we resist manipulation from outsiders using stories as well. Everybody gets to play the game. Haven't you seen the great stories people have told in response to attempts at manipulation with stories? (Google "Kendall Jenner Pepsi ad." You're in for a treat.) Mentioning only one side of the story game is like saying, "We can't go out on the highway! They'll all be driving cars!" -- while driving a car. Speaking of cars. . . .
Let's consider two kinds of stories about cars. Story A is: "Buy this car, and you will have beautiful, romantic partners and a fascinating life." (Laughter) There are a lot of people who have a financial incentive to promote that story. But, say, the alternative story is: "You don't actually need a car as nice as your income would indicate. What you usually do is look at what your peers do and copy them. That is a good heuristic for lots of problems, but when it comes to cars, just buy a Toyota." The first of these so-called stories is a causal statement, not a story. It has no setting, plot, or characters; nothing happens. Two things are linked, but that's a link, not a story. It could be rewritten as "a nice car makes a happy life" without losing any meaning. The second story is not even a causal statement; it's a straight up argument. "You don't need a nice car" is about as far from a story as you can get. If you are going to argue that people should be suspicious of a thing, you should first find out what the thing is. Ideally, you should be able to give examples of the thing that are examples of the thing. If I went around saying "watch out for vampires, because they'll turn you into werewolves," nobody would listen to me, and rightly so. You can never get out of the pattern of thinking in terms of stories, but you can improve the extent to which you think in stories, and make some better decisions. I am having trouble responding to this sentence because I have spent the last eighteen years helping people make better decisions through the use of stories. There is no doubt that I am biased when it comes to the question of whether stories help or hinder decision making; but I would like to encourage Mr. Cowen to examine the abundant evidence for himself. So if I'm thinking about this talk, I'm wondering, of course, what is it you take away from this talk? What story do you take away from Tyler Cowen? . . . Is it like quest, rebirth, tragedy? Or maybe some combination of the three? I'm really not sure. . . This is a fascinating statement. First he suggests that viewers will interpret his talk as one of three simple stories. This seems in keeping with the message he has been promoting. But then he says, first, that they may interpret his words as "some combination" of stories, and second, that he's not sure how they will interpret his words. If all stories are simple, this is impossible. But in fact, he has unwittingly pointed to two more ways in which stories can complex, ways I forgot to mention above. First, stories can be combinatorically complex, meaning that they can take elements of setting, character, and plot from other stories and mix them up in new ways. We all mix up stories every day, only we're so good at doing it that we don't realize it. Listen to three people have a conversation about just about anything. If you listen carefully, you'll hear stories being blended into new varieties. Society is a great big story mixing machine, and it never stops mixing. Second, stories can be complex in multiple perspectives, meaning that the same story as experienced by two people can be two completely different stories. That's why Cowen can't guess what story we will hear when he talks: because each person hears a different story. That's one of the complexities of stories. When I thought of this multiple-perspective aspect of storytelling, a story flew into my mind: the Jorge Luis Borges short story Pierre Menard, Author of the Quixote. In the story, Pierre Menard attempts to translate the classic novel Don Quixote into an updated version for contemporary audiences. While doing so, he immerses himself so completely in the work that he recreates Don Quixote word for word and line for line as it was originally written. The resulting work appears to be identical to the original but is actually an entirely new work. Borges' story highlights one of the most exciting things about stories, to my mind: that the same story is not the same story in a different place and time. This means that no story can ever be too old or too simple or even too familiar, because you can never know what a story will mean until you tell it, or hear it, or remember it. But what Cowen said about the stories he told in his talk makes me curious. Did he tell any stories during his talk? He told one. I'll go back and get it. I used to think I was within the camp of economists, I was one of the good guys, and I was allied with other good guys, and we were fighting the ideas of the bad guys. I used to think that! And probably, I was wrong! Maybe sometimes, I'm one of the good guys, but on some issues, I finally realized, "Hey, I wasn't one of the good guys." I'm not sure I was the bad guys in the sense of having evil intent, but it was very hard for me to get away with that story. This may be the only actual story in the talk. He used to think he always did the right thing, and then one day he realized that at least once he had done something wrong, and that caused him to reevaluate his identity as a good person. Now that's an interesting story. And it's a complex one, especially given his black-and-white representation of "good guys" and "bad guys," which is itself revealing and worthy of thought and discussion. It reminds me of a whole bunch of stories I'd like to tell in response. Here's one, just to get the ball rolling. In my life I've been all over the place politically. I've been a staunch conservative and a bleeding-heart liberal. Let's say twenty years ago I was in a knee-jerk-liberal phase, and I happened to see a guy making jokes on TV. His name was Dennis Miller, and he made this one joke that really got me going, because we had just received a bizarrely intrusive census form (which asked, essentially, how much money do you have and when are you away from home). The joke was: if they want to know how many people there are in the country, why don't they just count how many census forms they've sent out? I loved that joke, so I looked up Dennis Miller to see what other sorts of funny things he might be saying. Apparently he is (or was at that time) quite the libertarian. I was shocked to see this, because it meant that I might be a libertarian; and that made me question (yes, all over again) what I really was. That was the day I stopped being anything else than a human being. I still have lots of opinions, and you'll hear them if you talk to me, but nowadays I'm just a person. Okay, Tyler, your turn. What does that story remind you of? I'll bet we could get a pretty complex chain of stories going. Why not try it? There are just a few more bits of Cowen's talk that I think we need to look at. I'm not here to tell you to burn your DVD player and throw out your Tolstoy. And here we have yet another reference to commercial storytelling. Come to think of it, there is not one reference to conversational story sharing in the whole talk -- except for the one personal story Cowen seems to have told without knowing he was telling a story. Do you see what I'm saying about how people don't think their own stories are stories? I'm not making this stuff up. To think in terms of stories is fundamentally human. There is a Gabriel Garcia Marquez memoir "Living to Tell the Tale" that [says] we use memory in stories to make sense of what we've done, to give meaning to our lives, to establish connections with other people. None of this will go away, should go away, or can go away. Should we think more in terms of stories, or less in terms of stories? I've talked to a lot of people about stories, and I've watched a lot of people tell stories. One thing I've learned is that people vary an enormous amount in how much they think in terms of stories. As Winnie the Pooh so sagely told us: "Some do and some don't. You never can tell with Heffalumps." [A movie] was a pretty good movie. Really? I'm not sure. I don't think I've seen it. You saw it with me. I did? Where did we sit in the theater? Front and center, in the third row. Don't you remember? Hardly anybody was there. We went there after dinner at that Greek restaurant. Oh, yeah, I remember it now. It was a good movie. Those who know me well are used to these conversations, and they know that I'm always asking "where was it" and "what color was it" and "what did I have on" because my memory is almost completely visual. I experience events like everybody else does, but in my memory they all get plated out onto these tintype sheets, and after a while that's all I have left. That's why I got so excited in The Neverending Story when Bastian was drawing up pictures from the picture mine and laying them out on the snow, hoping to recognize something from his life. That's how I remember pretty much everything. Making stories out of the pictures helps me hold them together. Each person's relationship to stories is a complex story just like mine, full of details about their genetics and birth and childhood and all the things that have happened in their lives. So it's not a matter of whether we should think more or less in terms of stories; it's a matter of working with what we already do. But that's not just true for stories; it's true for every mode of thinking and learning. I once knew a man who claimed that he had read three books in his whole life. I've read thousands. But we're both smart people, capable of many things. Details like exactly how we learn and think aren't important. We're all different, and we all have to figure out how to make our brains work. Thinking in stories is one of our ways of thinking, but it isn't the only one. We also make lists, compare options, build logical arguments, create representations and designs, play with metaphors, make observations, try experiments, develop procedures, negotiate rules. For some people, thinking in terms of stories is a habit; for others it's a crutch; for some it's a joy; for others it's a foreign land; and that's just okay. The important thing is to find what works for you, do it as well as you can, and -- this is the hard part -- refrain from telling everyone else how to use their own brains. It is as wrong to blame people for thinking in terms of stories as it is to claim that we all need to be doing so. We are once again at the main issue raised by Tyler Cowen's talk. When we hear stories, should we be more suspicious? It would be dangerous to be more suspicious when we hear a story, because that might just make the people who want to manipulate us move over to some other thing we no longer think is suspicious because it's not a story. We should be suspicious whenever we think someone is trying to manipulate us, and we should be aware that manipulation can take on many forms. And what kind of stories should we be suspicious of? For this question I have a suggestion. We should be suspicious of simplified stories, whether we are hearing them or telling them. How can you tell if a story is simplified? To answer that question, I am going to ask you to indulge me in a metaphor. Stories are playthings that help us live more creatively, so it makes sense to compare them to toys. A simple story is like a ball. Stories pop into our minds and out of our mouths all the time, every day, as things happen to us and we think and talk about them. As children, we spend a lot of time playing with simple stories. We try stacking them, squishing them, eating them, standing on them. We learn what we can and can't do with stories, and with the things in stories: time, people, cause and effect, help and hindrance, intention, motivation, chance, power, mistakes, love. Playing with stories helps us learn how to live. As we get older, our stories get more complex. A complex story is like one of those multi-sensory balls that do things regular balls can't. They wiggle, glow, expand, change color, or roll around in strange ways. They have weird bumps, rubbery fingers, holes, grab handles, or slippery skin. They have liquid, glitter, tiny stars, smaller balls, and all kinds of other things inside. Children use multi-sensory balls to explore reality in new ways. What will happen to the water inside the ball when we throw it? Can we swing the ball around by its rubbery strings, or will they break? (They break.) In the same way, we use complex stories to help us explore reality in new ways. What would happen if a man died before he could finish a monumental opus and left it to his reluctant wife to finish? Middlemarch. What would happen to a healthy man who visited a tuberculosis sanatorium and decided he liked it there? The Magic Mountain. Our most complex stories are like every kind of multi-sensory ball ever made rolled into one, and as adults we keep playing with them as long as we live. A simplified story is also like a ball, but it's like one of those balls that is attached to a paddle with a gummy string. You can't do much with a simplified story except mash at it with the paddle over and over again. There is something to be said for the hand-eye coordination gained by playing with a paddle ball, and it does make a wonderful racket, but the apparatus cannot be said to excel at supporting creative play. Kids tend to play with a paddle ball until they master the art of getting the paddle to hit the ball consistently, then lose interest. Likewise, people tend to tell simplified stories for a purpose other than play: to achieve a goal or to make a racket, but not to make sense of things. It's hard to experiment with a thing that can only do one thing. That's why simplified stories are not as useful (to their tellers or their audiences) as either simple or complex stories. So how can you tell a simple story from a complex story? By bouncing it. How do you bounce a story? By asking questions about it. People do this all the time in conversation. They'll say something like, "But why did you stop stirring it? Didn't you realize it would burn?" or "Where did the ringing sound come from?" They're bouncing the story around, seeing how it responds, playing with it. The wonderful thing about bouncing is that it doesn't just tell you whether a story is simple or complex. Bouncing makes simple stories complex. It adds ridges and bumps and finger holes (that is, detail and nuance) until the ball turns into a multi-sensory ball. In fact, bouncing is how complex stories come into being. Something happens, and a simple story forms, and we start bouncing it, and questions get asked (by ourselves and others), and the story gets more and more complex over time. Every complex story ever told (including all of our great literature) started out as a simple story somebody bounced. Okay, but how do you tell a simplistic story from a simple or a complex story? By bouncing it. A simple story bounces simply, and a complex story bounces complexly, but a simplified story bounces back -- to its original intent, like a ball tethered to a racket. What should you do if you think someone has told you a simplified story in order to manipulate you? What should you do if you realize that you have been telling a simplified story, to yourself or to others? Break the gummy string. Disconnect the story from its intent. Change it into a complex story. You can do it. Anybody can. Here's how. First check to see if it's a story. If nothing happens in it, it's not a story. "Your life is important" is not a story. "This car will make you happy" is not a story. Those are statements, claims, arguments; and you can counter them in other ways. If you're sure that what you heard (or told) is a story, bounce it around to see whether it's a simple story, a complex story, or a simplified story. If it bounces simply (meaning: you get simple answers to your questions), it's a simple story. If it bounces complexly (meaning: you get surprising answers that lead you to new questions), it's a complex story. If it bounces back (meaning: you get extremely consistent, tunnel-vision answers), it's a simplified story. If you find out that the story is a simple story, you can either make it complex or leave it alone. There's nothing wrong with simple stories; they're just the small things of life. You can step over them like you do ladybugs on the sidewalk. If you're sure the story is a simplified story, now is the time to break that string. There are at least five ways to do it. Make the story internally complex by retelling it with more nuances and details. By doing so you can extend it, question it, challenge it, deepen it, transform it. If you heard the story, retell it in your own way, from your own point of view, and it will become a complex story. If the simplified story is your own, you can still tell it from a different point of view: just come at it from a different angle. Put yourself in a different frame of mind, retell the story, and see what changes. Or ask someone else to retell your story from their point of view. Make the story relationally complex by telling a new story that has the original story nested inside it. People do that all the time when they tell stories about their reactions to stories they've experienced. If you stand outside a movie theater and listen to what people are saying as they come out, you'll hear lots of nested stories. Nesting a story transforms it in two ways, changing it in both context (because you're surrounding it with a new setting) and content (because nesting requires retelling). Make the story externally complex by connecting it to other stories. I did that above when I told my gosh-I-must-be-a-libertarian story in response to Tyler Cowen's story about being wrong. People do this all the time. Every time somebody says "that reminds me of the time" they're making stories relationally complex. Make the story combinatorically complex by mixing it up with other stories. If you can't figure out how to do this on your own, get some friends to help you. Throw the story together with some other stories and see what you get. It is not necessary to run away from stories, even those that are obviously engineered to control. You and I and all of us already have what we need to engage with the stories in our lives. What we need is to start paying more attention to stories -- all kinds of stories -- and practice working with, and playing with, the stories that are all around us. I sound like I've broken my own rule, don't I? I've told you to think in terms of stories, even if you don't usually think that way. But I am convinced that many people today can think in stories, and would benefit from doing so, but do not believe that they are allowed to do so because they are not professionally associated with storytelling -- or because of some other nonsense about how stories are bad for them. That's ridiculous. You are allowed, and it is good for you (and it's bad for you; but learn more about stories, and it'll be better for you than it would have been). If you can breathe, you can tell and listen to and make up and make sense of and enjoy the stories in your life. It's your birthright as a human being. It belongs to you as much as it belongs to anyone else. As always, thank you, dear reader, for coming on this meandering journey with me. I welcome discussion in the comments or elsewhere.